Contents. List of Contributors. Preface (D. Leroith). Molecular Aspects of GnRH Gene Expression (M.E. Clark, M.A. Lawson, D.D. Belsham, S.A. Eraly, and P.L. Mellon). Molecular Aspects of Hormone Deficiency caused by PIT-1 Gene Mutations (L.E. Cohen, S. Radovick, and F.E. Wondisford). Regulation of Growth Hormone Gene (J.J. Kopchick and F. Woodley). Molecular Aspects of the Insulin-Like Growth Factor IGF Genes (P.H. Steenbergh, P.E. Holthuizen, and J.S. Sussenbach). Molecular Aspects of Insulin-Like Growth Factor Binding Proteins (R.C. Baxter). Molecular Basis of INsulin Action (S.B. Waters, K.H. Holt, A.L. Olson, and J.E. Pessin). Molecular Aspects of the Glucagon Gene (B. Laser and J. Philippe). Molecular Aspects of Familial Hypocalciuric Hypercalcemia (M.R. Pollak and E.M. Brown). Molecular Aspects of Steroid Receptor/DNA Binding (J. Zilliacus, A.P.H. Wright, J. Carlstedt-Duke, and J. Gustafsson). Index. Historically the field of endocrine research has always been at the forefront of scientific endeavors. The investigators of these important breakthroughs in research have been rewarded by numerous Nobel awards. In the field of diabetes alone, Nobel prizes have been awarded to researchers who discovered insulin, characterized the protein and invented radioimmunoassays using insulin as a paradigm. Not surprisingly, biomedical researchers have always been attracted by the endocrine system and other similar systems of intercellular communication. 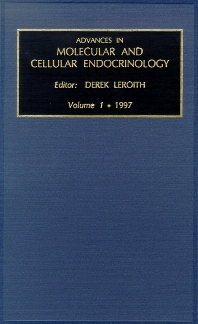 Over the past two decades, endocrine research has developed rapidly and adapted modern molecular and cellular biology techniques for its specific use. These changes have allowed researchers in the field to maintain their edge. Thus, endocrine disease-related genes have been characterized and mutations in these genes have helped explain common and less common endocrine disorders. Our understanding of the regulation of gene expression has been greatly enhanced by molecular techniques. In an attempt to bring investigators up to date with the recent advances in this exploding field we have decided to publish a series entitled Advances in Molecular and Cellular Endocrinology. Internationally famous investigators have agreed to participate and their contributions are appreciated. Volume 1 has focused on aspects of the hypothalamic-pituitary axis including GnRH and GH gene regulation, molecular aspects of insulin, insulin-like growth factors and glucagon. In addition, reviews on the recently cloned calcium receptor and steroid receptor interactions with DNA are presented.